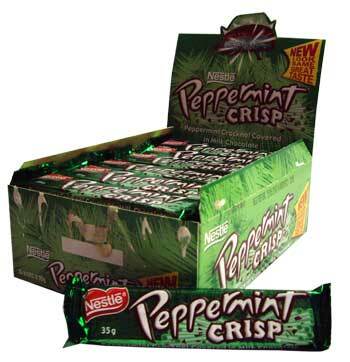 The peppermint crisp is a wonderful, exciting and different chocolate experience. It is made from milk chocolate which covers green mint flavoured crystals that shatter providing a delightful texture and flavour. Milk Chocolate (58%) (Sugar, Full Cream Milk Powder, Cocoa Butter, Cocoa Mass, Palm Fat (Emulsifier (Soy Lecithin)), Emulsifiers (Soy Lecithin, E476), Flavour), Peppermint Cracknel (42%) (Sugar, Glucose Syrup (Derived from Wheat or Corn), Palm Fat, Peppermint Oil, Colour (E141), Emulsifier (Soy Lecithin), Wheat Flour). Milk Chocolate contains minimum 22% cocoa solids and 25% Milk solids. I remember this as a child called mint cracknell. Was amazing. I am 50 years old now and wish I could get some. Flash back from my child hood. These bars are amazing. They look ike chocolate encased kryptonite, but have a minty refreshing taste that leaves a fresh flavour in your mouth long after they have finished. These are too good for sharing, hide them away from your friends and loved ones. This is a most unusual mint bar - dark chocolate covers the wonderfully crunchy cracknel. Delicious to eat, and perfect for adding the finishing touches to Chocolate Ripple Cake (a classic Aussie dessert).